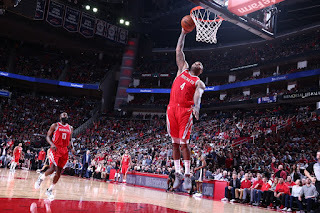 If you're the Houston Rockets, the up and coming challenger to Golden State Warriors hegemony, you have to prove you can beat them in the regular season. You have to prove it not to them, not to the fans, but to yourself. The best you can possibly ask for is to win two out of three and steal tiebreaker from the best team in the NBA. Tonight, the Houston Rockets did exactly that. This was the biggest win of the regular season, and the most important of the 82 nights. The Houston Rockets beat the Golden State Warriors twice in three tries. This was the win. For the first time since Mark Jackson was their head coach, the Rockets have won the season series against the Warriors. The tiebreaker and the one-game swing could potentially be huge for the Rockets this season. The moral victory is even bigger. This is a Rockets team that knows, for sure, that they can make the Warriors bleed. They can pick their pockets, they can run up a 17 point lead, and they can out-execute them in crunch time. The Warriors will have no more chances to destroy this hope that the Rockets have created for themselves. Until the playoffs, the Rockets now feel they can beat the Warriors. The Rockets now believe that they are dangerous. Good luck to anyone trying to prove them wrong. Chris Paul, derided and mistrusted, crushed by the Warriors again and again, paid back that debt with interest. He was an utter tornado, scoring 33 points on 50% shooting to go with 11 rebounds, 7 assists and 3 steals. Chris Paul accepts nothing less than victory and tonight he had the will and the teammates to achieve it. He had several absolutely critical threes, and a few midrange shots that were utterly criminal in their lack of respect. Any thought that Harden and Paul can't coexist has been exposed as nonsense at this point. The only thing that could have soured this batch was an unwillingness to work together, and the exact opposite has happened. James Harden, for his part, hardly looks like a man fresh off a hamstring injury. Instead, he looks like a man possessed, hitting daggers and stuffing threes late in the game to seal the win for Houston. He has a reputation for being laconic and even serene, but tonight it looked more like enlightenment. He may only have had 22 points compared to Paul's 50% more, but his shots were critical and his defense was astonishing. Trying to defend two different all-world playmakers with two totally different styles is sometimes an exercise in futility, and that's exactly the plan. With this herculean effort, the door has been opened, once again, on a potential 1-seed for the Houston Rockets. James Harden is back and looks ready to dominate. Chris Paul hungers for wins and now has the tools to take them. Even with Eric Gordon shooting 0-9 from deep and Ryan Anderson 0-1 as well, the Rockets look lethal once again. They're healthy, Trevor Ariza and Gerald Green are back from suspension now, and the rest of the games for the month look eminently winnable. The Rockets are 17-0 when Paul, Harden and Clint Capela all play. This win is not a fluke. This win is the plan.